Playtime With Puppy Dog Pals on DVD-Plus Puppy Dog Pals Inspired Snack Ideas! Disclosure: I received a copy of this DVD complimentary to review, but all thoughts and opinions are my own. The playful pups Bingo and Rolly are back for a new series of missions, and this time they have some very cute help along the way! When inventor Bob is away, Bingo and Rolly leap into action, and sometimes trouble, having adventures and learning lessons all around the world. With Playtime with Puppy Dog Pals now on DVD, you can now have the ultimate collection of Puppy Dog missions in your home for you and your little ones to enjoy! Featuring five full-length episodes (each episode contains two fun-filled stories), this new DVD release is guaranteed to please any fan of the adventurous pups. Episode highlights include Bingo and Rolly breaking out their friend Hissy the Cat from her time-out, staging an epic prison escape, and the two pups scuba diving for buried treasure! But even after the five episodes, the fun’s not over yet! The DVD release includes BONUS episodes, featuring two full-length episodes from the newest season, introducing Bingo and Rolly’s cute, new, excitable neighbor, Keia! Bingo and Rolly help Keia find a rare unicorn for her owner, Chloe, and even help build her new, high-tech doghouse, if they can be careful enough not to break it! And the fun doesn’t end there, as eight bonus shorts are included. Each short is around three minutes long and is great for a quick bit of fun and cute energy! My daughter became an instant fan of the show when it first aired, and with the inclusion of Keia, it’s become a show she won’t live without. The fun songs and adventurous missions has her completely enthralled, giving her the confidence to go on her own adventures! With this new DVD release, she won’t have to live without her favorite cartoon pups! 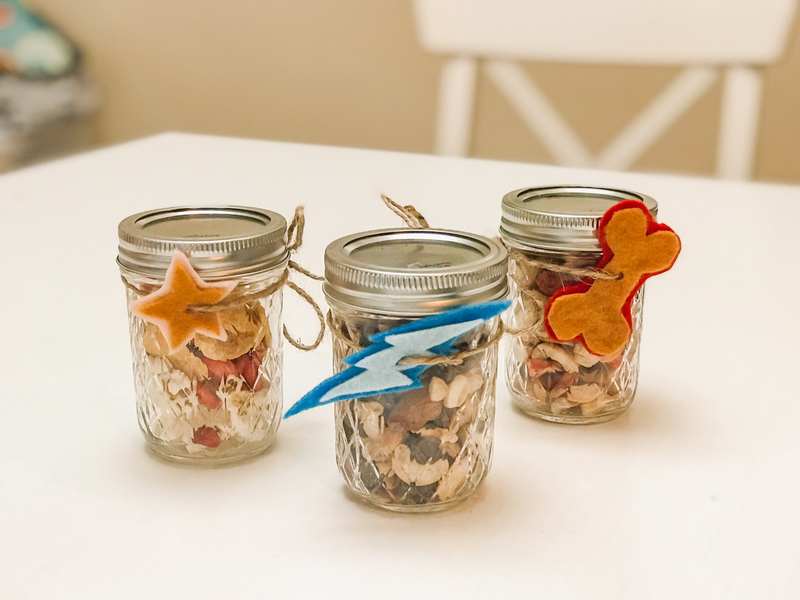 To celebrate the release, I made three different Puppy Dog Pals inspired snack jars, one for Bingo, Rolly, and Keia! The Bingo snack jar has almonds, cashews, and dark chocolate chips. The Rolly snack jar has cashews and freeze dried strawberries. The Keia snack jar is filled with unbuttered popcorn, candied mango, and freeze dried strawberries. Around each jar I cut out the pups’ collar tag shapes out of felt to decorate. My daughter was so excited about them, especially the Keia one!